We have extended the application process for Bio Boot Camp-Coastal Session (June 17-21). The Mountain and BBC 2.0 camp application process are now closed. The due date for both the Student Question and Letter of Reference is April 24th, 2019 at 11 PM. Both are required for an application to be considered. Applicants will be notified on or before April 28th, 2019 as to whether they have a spot in the camp or on the waitlist. Applicants with a spot in the camp should be prepared to formally register and pay for camp on-line through UC Davis Campus Recreation by the end of April. If additional time is needed, please contact us. We want to provide opportunities to as many people as possible, but there are many constraints that we have no control over. We regret that we have wait lists, but we don't want to compromise the quality of the camps. We do take into consideration whether a camper has previously applied to the camp and been wait listed as it shows a strong desire to attend the camp. We also take into consideration the grade of the camper. Applications typically come from all over California, but also across the US and the world. We truly welcome feedback and suggestions. Campers and their families have influenced the evolution of the camps in countless ways and will continue to do so. Please contact us if you have any questions. Together with the UCD Museum of Wildlife & Fish Biology and Campus Recreation we launched Bio Boot Camp in 2011, a camp for junior high aged students who are interested in the natural sciences. There is limited enrollment and so we ask that the students themselves be part of the enrollment process. This is a full day camp from 8:30 am-5:30 pm on Monday, Tuesday and Wednesday based at UC Davis. Then on Thursday morning we travel to a UC Reserve for an overnight experience. This year to expand our program we are going to offer two separate junior high camps on different dates to different Reserves. (In the past we offered only week and alternated each year between the coast and the mountains. For instance 2017 was mountains and 2018 was coast.) 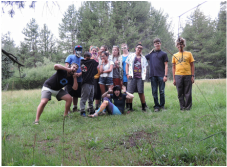 For 2019 the Coastal Session camp includes an overnight to the coast at the UC Davis Bodega Bay Marine Lab and Reserve and the Mountain Session camp will spend Thursday night in the mountains at the UC Berkeley Sagehen Creek Field Station just outside of Truckee in the Sierras. We return to Davis on Friday afternoon. Transportation (vans), 3 meals, and housing (bunkhouse or cabin) are provided. Each camp has an enrollment of 12 students and 2 instructors. Please apply to only one of these camps. If you have already attended our camps, please only apply to the camp that will be new to you. Partial need-based scholarships are available. Monday (8: 30 am - 5:30 pm) - We get to know each other, play games, explore the UC Davis campus, and go behind the scenes at the two host museums: the Bohart Museum of Entomology and the Museum of Wildlife and Fish Biology. Tuesday (8: 30 am - 5:30 pm) - We spend the day outside mucking around in local streams, catching insects, observing birds and exploring nature with guest scientists. Bring a change of clothes and a sense of adventure! Wednesday (8: 30 am - 5:30 pm) We go deep into standard museum practices from collecting data to preparing specimens including invertebrates and vertebrates. This can be a very hands-on day, if you so choose. Thursday 8:30 am -Friday 5:30 pm (overnight) The vans get loaded with campers and gear and we visit a UC Reserve to compare the nature and biodiversity of the Central Valley to either the coast or the mountains. We put into practice everything we learned at camp and we have a lot of fun while doing it. Together the Bohart Museum of Entomology, UCD Museum of Wildlife & Fish Biology, and Campus Recreation launched Bio Boot Camp 2.0 in 2013 after much enthusiasm from Bio Boot Campers who graduated out of the junior high program. The camp spans 7 days and 6 nights, so Sunday at 2:30 pm to Saturday at 2:30 pm. Pick-up and drop-off will be at the museums on the UC Davis Campus. The first night will be at the UC Davis Quail Ridge Field Station outside of Winters, CA so everyone will be getting to know the Central Valley. We will be stopping at the UC Davis campus on Monday for part of the day to tour the museums and the campus before traveling to UC Berkeley's Sagehen Creek Field Station outside of Truckee, CA . There we will conduct a group project and a mini individual project and explore the area. This is still camp, so there are hikes, exploring Lake Tahoe, silly games, a costume dinner and a lot of fun throughout. Transportation (vans), housing (tents/cabins) and food will be provided, but campers will be expected to help prepare group meals and clean up after themselves. This camp has an enrollment of 10 students and 3 instructors.